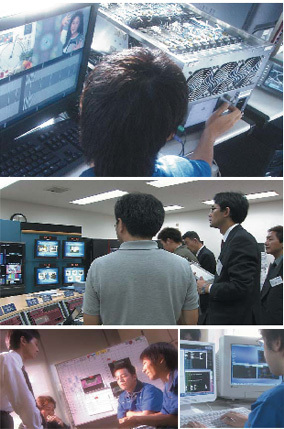 “Super High Vision” (8Kx4K) video was displayed at the Aichi Exposition in 2005. ASTRODESIGN contributed to this project by a processor for the ultra-high definition images and optical multiplex transmission system that can handle the data that is 16 times of Full HD picture(*). We also work for developing more sophisticated technology in the fields of high-speed transmission, uncompressed video/audio storage and security. It will contributes the benefits of images with higher quality. This recorder executes chromatic aberration compensation, outline correction and downconversion into 4K x 2K LCD and HD signals for video signals which have been shot by super highdefinition cameras. It also enables zooming to the desired angle for the HD signals. This disc recorder is capable of recording and playing back 23.8 Gbps super high-definition signals without compressing the data. Its small size has been achieved by using a 2.5-inch hard drive. This feature is complemented by the optimization of the hard drive controller to make the recorder easy to operate.